The Campus Security office is staffed 24 hours a day, seven days a week. Campus buildings are open from 6:30 a.m. to 11:30 p.m., Monday through Friday; and 6:30 a.m. to 7 p.m., Saturday and Sunday. See individual campus offices for office and staffing hours. At LCCC, we take our commitment to your safety seriously. After all, feeling safe plays a critical role in your academic success. That’s why we work to foster a culture of preparedness that focuses on your personal safety as well as the safety of our entire campus environment. Not only do we work hard to prevent potential issues, but we also work to immediately address your concerns. Any time you feel the need for assistance, have a concern, or even just want someone to walk you to your car, don’t hesitate to reach out to our Campus Security team. Be Prepared – Watch the video below about surviving an active shooter event. 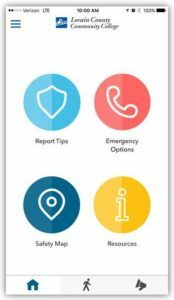 The new LiveSafe Mobile App is now available to LCCC students and campus visitors. LiveSafe provides a convenient and discreet way for you to communicate with LCCC Campus Security. The new app also provides access to various support services and lets you connect to friends and family members so they can monitor you and your location as you walk to your destination. During campus emergencies or other special circumstances or events, always remember to remain calm and follow the instructions provided by Campus Security and local law enforcement. Parking regulations have been adopted for the benefit of students, faculty, staff and visitors, and to enable Campus Security to manage a heavily trafficked campus. Parking is defined as the standing of a vehicle upon any property owned or controlled by the College whether accompanied or unaccompanied by an operator for more than one minute. Campus Security maintains a lost and found service for the campus community. Report lost items and turn in items that are found unattended to the Campus Security Office. Found property will be held for 60 days if unclaimed. Items can be claimed Monday – Thursday, 8 a.m. – 8 p.m., Friday 8 a.m. – 5 p.m., and Saturday 9 a.m. – 1 p.m. The Lorain County Board of Mental Health offers a free online screening tool for mental health disorders. Learn more about Online Screening for Mental Health Disorders. If you would like a security officer to make a presentation at your College 101 class, please Request a presentation for College 101 classes.